Lt. Georgiana Taylor has everything she could want. A boyfriend back home, a loving family, and a challenging job as a flight nurse. 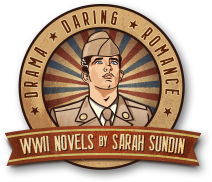 But in July 1943, Georgie’s cozy life gets more complicated when she meets pharmacist Sgt. John Hutchinson. Hutch resents the lack of respect he gets as a noncommissioned serviceman and hates how the war keeps him from his fiancée. While Georgie and Hutch share a love of the starry night skies over Sicily, their lives back home are falling apart. Can they weather the hurt and betrayal? Or will the pressures of war destroy the fragile connection they’ve made? Double finalist in the 2014 Golden Scroll Awards from both AWSA and the Christian Authors Network! Q: What inspired On Distant Shores? A: As a pharmacist, I found it strange that in WWII, Army hospital pharmacies were staffed by technicians with three months of training, and occasionally with actual pharmacists—who served as technical sergeants, not commissioned officers, despite their bachelors’ degrees. Meanwhile, nurses were officers. If an Army pharmacist and a nurse fell in love, they wouldn’t be allowed to fraternize, and she’d outrank him. When I ran the situation by my pharmacist husband, he was outraged by the injustice. Then I knew I had a story. To read more about pharmacy in the military and the fight for the Pharmacy Corps, see my blog post on Pharmacy in WWII—the Military. 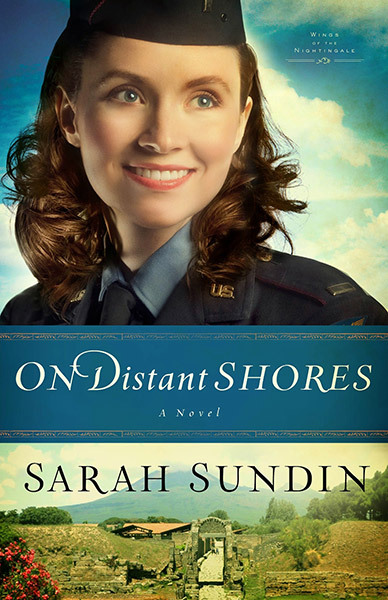 Q: In On Distant Shores, which units and people are real and which are fictional? A: Both the 802nd Medical Air Evacuation Transport Squadron and the 93rd Evacuation Hospital were real units, and their locations and activities in the novel follow the historical record. All personnel in the 802nd are fictitious with the exception of the CO, Maj. Frederick Guilford. In the 93rd Evacuation Hospital, real-life people mentioned include Col. Donald Currier, Maj. Charles Etter, and Tech. Sgt. Paskun. Other real-life people include Tech. Sgt. 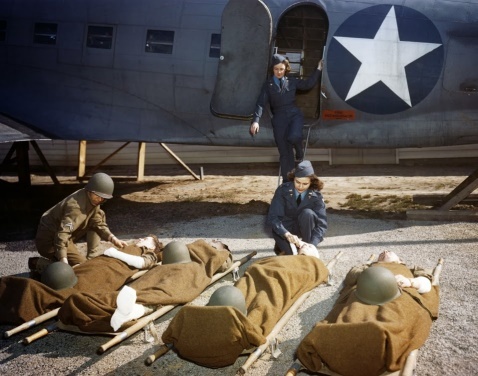 Robert (Bob) Knecht, a pharmacist with the 95th Evacuation Hospital who was killed at Anzio, Gen. Dwight Eisenhower, Lt. Gen. George Patton, Maj. Gen. Matthew Ridgway, Lt. Gen. Mark Clark, and Maj. Gen. John Lucas. Q: In On Distant Shores, which events are real and which are fictional? B-25 bombers fly past Mount Vesuvius during March 1944 eruption. (US Air Force photo). US 56th Evacuation Hospital at Nettuno on Anzio beachhead after bombing and shelling, 1944 (US Army Medical Department photo). A: The incident with General Patton slapping a patient is real, one of two such incidents in Sicily, the first at the 15th Evacuation Hospital on 3 August 1943 and the second at the 93rd on 10 August 1943. Patton’s “dialogue” is lifted from Colonel Currier’s account—although cleaned up for the novel. 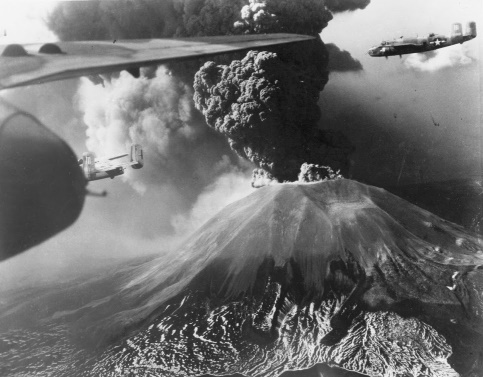 Mount Vesuvius did erupt in March 1944, showering troops and planes with ash and destroying several Italian villages. While there are no accounts of medical evacuation flights ditching in the Mediterranean, one flight did safely ditch in the Pacific, with all patients rescued—that account inspired the incident in the story. The plight of the American hospitals on the Anzio beachhead is real. These four hospitals endured daily bombings and shellings, which killed dozens of patients and medical personnel. The accounts of air raids on these hospitals are lifted from the historical record, including dates and times. See my blog post Courage Under Fire: US Hospitals at Anzio.